Between an early deadline, an international flight and jet lag, there was no way to make the deadline for the June Jewish Book Carnival. Book Expo America (BEA) is a fond memory. It was great to see friends and colleagues. The highlights: spending time with a very good friend, having Lemony Snicket sign a book for my daughter, and a surprise meeting with an old friend. I had the Pink Pig Press on my list of booths to visit. It sounded interesting, though not kosher. I walk up and see Vell Sweeny, the publisher, who has a mission: “every author should have a chance to be published whether they already have been or not.” So besides the pink pigs and the fun hats, I recognized the name. No, not from her adult fiction, The Moon Says It Will and Try Not 2 Die, nor from the book she wrote and her daughter illustrated, Second Hand Cat, but from Facebook. While the pros and cons of Facebook are a “whole ‘nother” discussion, it is rare to meet a Facebook friend, and the term “friend” is used very loosely. Most of these people are not really friends, and a lot delude themselves that they are loved and popular because they have an electronic connection with people who they will never meet in person. Well, Vell’s husband is my Facebook friend because I know him from kindergarten. We went through elementary, junior high school and high school together. His mother was there, and she lives in the same house in our hometown. So while interacting with authors, publishers, friends (not the Facebook type) and colleagues, seeing my kindergarten buddy was very cool. In a semi-related encounter, I waited on the long line to have Adriana Trigiani sign The Shoemaker’s Wife, a “breathtaking multigenerational love story that spans two continents, two World Wars, and the quest of two star-crossed lovers to find each other again.” This could describe many of the Jewish books I read, and as others have noted, with our loves of food, wine, and religion, I feel like this Italian-American author and I are simpatico. Adriana (all her readers feel like she is a good friend) is always full of energy and love. She asks everyone what they do. “You’re an independent bookstore owner. I love you. You’re a librarian. I love you. You like my books. I love you.” It was very nice to have a “love break” amidst some people rather aggressively walking the show floor. I was very excited about Cats on Ben Yehuda Street. Ann Redisch Stampler has established herself as the master of the folktale (Something from Nothing, Shlemazel and the Remarkable Spoon of Pohost, The Rooster Prince of Breslov and The Wooden Sword). She’s also written for YA (Where It Began and the soon-to-be-published After Party). I am obviously a fan, and now Ann has combined two things I love: Israel and cats. Francesca Carabelli’s cheerful illustrations give the book a touch of whimsy, and there must be “Armon HaDag - Palace of Fish” store somewhere in Israel. It’s a sweet story of neighbors who become friends when a cat goes missing. But most people in Israel HATE the stray cats, often called “Israel’s squirrels.” They are usually found eating out of garbage dumpsters and are not cuddly and friendly. 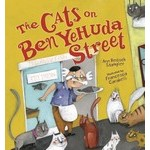 While this is not fodder for children’s books, it may be for a new reality show: The Real Cats of Israel. I picked up a “free uncorrected proof” (not sure how this is different from an advanced reading copy) of My Basmati Bat Mitzvah (interesting, alliterative title) by Paula J. Freedman (reminiscent of Starring Sally J. Freedman as Herself by Judy Blume). It’s about Tara Feinstein, an Indian-Jewish-American who is facing this Jewish rite of passage with some ambivalence. While this theme is not new (Sam I Am by Ilene Cooper, The Truth about My Bat Mitzvah by Nora Raleigh Baskin), the bits of Indian culture had a new twist. Some of the elements of this dramatic pre-bat mitzvah time were captured well: the shopping, the boy who was a friend but now may be a boyfriend but there is so much pre-adolescent awkwardness about it that it takes a while, and the struggle to be your own person and make your own decisions without parental input or approval. Part of the drama is that Tara decides to incorporate her Indian heritage into her bat mitzvah by wearing a sari and serving ethnic food. It’s a cute story, not too heavy, and reading it (for deadline) brought back fond memories of the STBAC. Consider the Birds is definitely not a Jewish book. It is written by Debbie Blue, a pastor at the House of Mercy Church in St. Paul, Minnesota. It is published by Abingdon Press, which touts itself as “continuing a tradition in religious publishing for crossing denominational boundaries with thought-provoking and enjoyable books,” although it is an imprint of The United Methodist Publishing House. But as Pastor Blue considers the birds she “approaches scripture like a farm wife handles a chicken, carefully but not delicately, thoroughly but not exactly cautiously.” Part of this approach is to use VERY Jewish sources, like Aviva Zornberg and Rabbi Natan Slifkin, better known as “The Zoo Rabbi.” So just after we read the weekly Torah portion about quail (Parshat Beha’aloscha; Numbers 11, verses 30-34), I read the chapter about “Quail: Desire and Slavery.” She asserts that “the story of the Israelites wandering in the wilderness, learning to know God—is not merely an item of Biblical history. These are stories that help us understand what our life is like with God. We still wander, we doubt, we wonder if it has been foolish to follow God because we often find ourselves in the desert. The quail in the Bible are both a sign of God’s extravagant care, and a sign that the Israelites’ desires need transforming. We are not exempt from the desert wanderings—but how else would we be transformed?” Jewish readers can skip the chapters about the pelican, and the chicken, but essays about the eagle and the ostrich provide for thought-provoking reading. I was disappointed that there weren’t as many Jewish publishers or books, but I was happy to see my friend from Gefen with his Israeli flags displayed. Ilan was handing out advance reading copies of the English translation of Lihi Lapid’s book Woman of Valor (Eshes Chayil). According to the publisher’s description, “Lihi Lapid tells a true-life story of women and men struggling to live up to modern pressures: a story about shattered dreams, and about finding the strength to gather up the pieces and to learn to smile again.” She includes much of her own story of balancing her career as a photographer and newspaper columnist with giving her three children enough personal time and attention. “Her man” is Israel Finance Minister Yair Lapid. I also stopped by the Cinco Puntos Press booth. This small but mighty press from El Paso has published such fine books as Benjamin Alire Sáenz’s Everything Begins and Ends at the Kentucky Club, the winner of the 2013 PEN/Faulkner Award for fiction, and recent Sydney Taylor Honor Book Blood Lie by Shirley Reva Vernick. But I was there to see my fellow Israeli Eve Goldberg Tal, author of Double Crossing and Cursing Columbus, both Sydney Taylor Notable Books for Teen Readers. We live less than an hour away from each other, but I had to travel 6,000 miles to see her in person. I was rewarded when she signed my copy of her first book in Hebrew, Ha-Agala Borachat (The Runaway Baby Carriage). I found this gem from 1985 at a used book store, and although it is an ex-library book in barely acceptable condition, I treasure it – partly because I know Eve, and partly because I can understand the story. Eve informed me that a new edition is going to be published shortly. I will have to make a date in Israel to have her sign that one! Go2Films did not have a booth at Book Expo. Founded in 2005 and specializing in the distribution, marketing and exhibition of Independent Israeli films, my friends there opened my eyes to the diverse aspects of Israeli society and culture before I made aliyah. I’ve seen many films from their catalog, and I’ve learned something from each one. One of their latest had me laughing and crying at the same time: Welcome and Our Condolences. As Misha and his family emigrated from Russia in 1991, he was given a camera to occupy him. While making aliyah is challenging, it is even more so when your aunt dies on the plane and you have to deal with Israeli bureaucracy. Sitting around waiting to be processed, needing the right forms, having government employees yell at you and get angry when you yell back—ah, such fond memories!! Watching the movie, with some bad camera angles and some big pauses, I thought it was a real documentary until the credits rolled. Coming soon: I enter the 21st century and a fabulous gluten-free cookbook. Just catching up on a few things. It was great seeing you at Book Expo. Thanks for letting me relive it again with you. I am missing you!